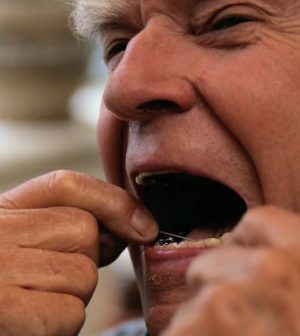 Regular brushing and flossing can save your teeth into old age. The bacteria involved in gum disease might play a key role in the development of Alzheimer’s disease, new research suggests. DNA from the bacterium Porphyromonas gingivalis is more often found in the brains of Alzheimer’s patients, said lead researcher Jan Potempa, a professor at the University of Louisville School of Dentistry in Kentucky. P. gingivalis is one of the causes of periodontitis, the most serious type of gum disease. “The DNA can be found in the Alzheimer’s brain, but less frequently at a lower level in the brain of people who died at the same age from causes other than Alzheimer’s,” Potempa said. Alzheimer’s-affected brains also contain higher levels of a toxin secreted by P. gingivalis called gingipain, he said. Potempa and his colleagues think the bacteria and its toxins might be connected with Alzheimer’s disease, a suspicion supported by their research involving laboratory mice. Researchers infected the mouths of mice with P. gingivalis and found that the bacteria did spread into the brain. The infection appeared to increase production of amyloid beta, a protein linked to Alzheimer’s, and also caused inflammation in the brain. A phase 1 clinical trial is underway to see if COR388 can prevent Alzheimer’s, researchers said. The company Cortexyme Inc., based in San Francisco, developed the drug and is supporting the research. If this theory of Alzheimer’s disease proves true, then it could be that the amyloid plaques that are thought to disrupt brain function might actually be the brain defending itself against infection, Potempa said. This study is part of a growing field of research looking into whether viral or bacterial infections might be associated with Alzheimer’s, said Keith Fargo, director of scientific programs and outreach at the Alzheimer’s Association. Another well-respected research team is investigating possible links between herpes virus and Alzheimer’s, he said. “It’s actually receiving a lot of attention over the past couple of years. If you’d have asked me three years ago, I would have said it’s a fairly fringe idea,” Fargo said. But a direct cause-and-effect relationship has yet to be established between any infectious agent and Alzheimer’s, Fargo said. He said it’s possible that bacteria like P. gingivalis are found at higher levels in Alzheimer’s brains because those brains are weakened and less able to defend against infection. “As the brain gets sick with Alzheimer’s disease or with something else, it becomes less able to fight off these things,” Fargo said. “I certainly wouldn’t worry a group of readers that this is the cause of Alzheimer’s, or if you’ve got gum disease you’re more likely to develop dementia later in life,” he said. Petersen said the mouse evidence is interesting, but still a step removed from Alzheimer’s in humans. Research on animals does not always produce the same results in humans. “That would argue this is plausible but again, it’s genetically engineered mice and it’s kind of far from human reality at this point,” he said.